In the past few decades, an increasing number of firms are forming relationships with each other as an alternative to traditional market exchange. A large amount of the literature in this area focuses on vertical integration between members of the supply chain. Far less research has examined networks formed by competitors in the same industry, and, their contribution to the marketing strategies of small to medium sized enterprises (SMEs). The wine industry is one such context where a large amount of collaboration and networking takes place, particularly at the regional level. 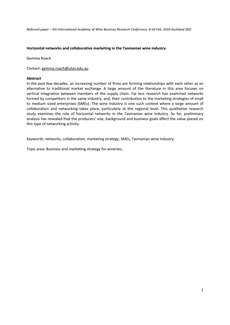 This qualitative research study examines the role of horizontal networks in the Tasmanian wine industry. So far, preliminary analysis has revealed that the producers’ size, background and business goals affect the value placed on this type of networking activity.